'Twas the night before Christmas, when all through the house, not a creature was stirring, not even a mouse. Then suddenly, this happened. Oh yes, it's that time of year again. Valve's annual Steam Holiday Sale has begun, with more daily deals and "Flash Sales" than you can shake a Weighted Companion Cube at. And the even better news is that it will run until January 3, so you'll be able to get a fair bit of mileage out of that Christmas money. But that's not the only reason we've been talking about Valve this week. The limited number of Steam Machines have been shipped out and we've been getting stuck into Steam OS, Valve's Linux-based operating system. You can go read our hands on review of the beta, in which we said: "Forget the Xbox One and the PlayStation 4 - Valve's SteamOS is the biggest shake-up to the gaming industry yet, a free operating system that allows gamers to roll their own machines. It's still very much in the nascent stages of development, and the beta isn't exactly easy to use, but as a proof-of-concept it's intriguing and potentially monumental." Meanwhile, keen to get into the real guts of the Steam Machine, the team at iFixit got themselves one of Valve's boxes and gave it a good old teardown. If you plan on trying this at home, just remember that there's no repair manual available right now. (We hope) you won't be pulling your Xbox One or PS4 apart in the same way, so instead we've covered the ins and outs of both consoles for you in our conclusive 2013 console verdict. 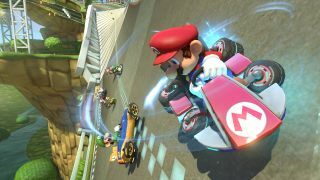 Nintendo dropped a new trailer for Mario Kart 8 this week, and it got us a little bit excited. The teaser shows off some new courses including one in an airport, one in the clouds, and one with, err, cakes. More importantly, check out the awesome moustache physics at 0:13. That's some real next-gen stuff right there. Finally, it was yet another week of great news for Oculus Rift, as the VR team bagged former EA executive David De Martini. Previously in charge of brokering partnerships at EA, De Martini will assume a similar role at Oculus as its head of worldwide publishing. "I'm figuring out how to partner effectively with big developers, small developers, all the way down to the individual who just wants to make something great for the Rift," he said.